Just as of today, I got online and available the new Math Mammoth Grade 7-A and 7-B worksheets collections. These pre-algebra sheets contain problems for beginning algebra topics such as expressions, linear equations, and slope - plus your typical 7th grade math topics such as integers, fractions, decimals, geometry, statistics, and probability. You will find the problems are very varying as these worksheets have been created one by one (not script made). Go download and enjoy the free sample sheets! - including a Percent Fact Sheet. How many times does 3/4 fit into 15 6/8? "How many times does 2 fit into 834", then we'd all soon realize that we need to use DIVISION. Are you ready? Remember how to divide fractions? 2) But wait a minute! These numbers aren't so difficult after all... because 6/8 equals 3/4. Let's use this thinking cap of ours - mental math. 3/4 goes into 1 1/2 two times. Doubling that, we find 3/4 goes into 3 four times. And so to 15... fives times that: 3/4 goes into 15 4 × 5 or 20 times! And, of course 3/4 goes into 6/8 exactly one time. So all total 3/4 goes into 15 6/8 exactly 21 times. No leftovers. And that was easy! On another note, Denise in Illinois has made up a mnemonic poem for kids to remember better the "invert and multiply" rule. The books in the green series are worksheets by topic, instead of by grade. The worksheets have been pulled out from the grade 3, 4, 5, and 6 collections (so contain duplicate material with those). These per topic collections, I feel, will be very helpful for teachers who need worksheets on some particular topic, but with varying difficulty levels. Check out the freebie sample sheets on the two pages above! A little fun video clip where Pa and Ma Kettle prove themselves good 'mathematicians'! He "proves" by long division that 25 ÷ 5 = 14, and she "proves" by multiplication algorithm that 5 × 14 = 25. Recently I've gotten started with the project of writing algebra worksheets for Spidersmart tutoring company. To guide me, I have table of contents from one book many of their students are using, plus two algebra 1 books I have at home. The one is Algebra 1 by Houghton Mifflin, from 1989 & 1986. The other is Merrill Algebra 1 Applications and Connections by Glencoe / McGraw Hill, 1995 & 1992. So in essence there's 6 years in between the first publications of these books. But the books are quite different. I've been wondering if it has been a general trend among algebra books (I don't know), or I just happened to use two very different books. The first is black-and-white with red, the second is full color and sprinkled with photographs. But the main difference is how much more advanced mathematically the first book is. I've been especially looking at the second "chapters" or parts, where both books practice the four basic operations and their properties. "Proof by vigorous handwaving: Works well in a classroom or seminar setting. Proof by funding: How could three different government agencies be wrong?" You might think this is slightly off topic, but I got the opportunity to conduct an email 'inverview' with a NASA astronomer Dr. Sten Odenwald who is heavily involved in math and science education. Sten has been writing weekly space-related math problems for grades 9-11. You can find those here. 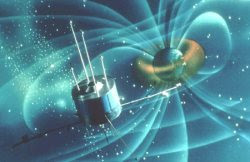 He has also studied space weather, which is quite interesting to learn about. And here's the link to the interview. A man travelled 8 miles in the second hour. This is 1/7 times more than during the first hour, and 1/4 times more than he travelled during the third hour. What is the total miles he covered in three hours? In this problem, it is easy to get "deceived" and think that you'd just go 1/7 × 8 miles or something like that. But think first; did the man cover MORE miles during the first hour than during the second hour? Yes; it says plainly that the 8 miles was 1/7 times MORE than what he covered during the first hour. Is that 8 miles a LOT more, or a LITTLE BIT more than what he traveled during the first hour? It's 1/7 times more, so it's a little bit more. Trigonometry: Finding the value of sine Pi/3. First we need to remember that the whole circle is 360° and in radians it is 2Pi. So then Pi is 180°, and Pi/3 is 60°. To find sine of Pi/3, you'd want to have a right triangle with one angle 60°. Fortunately that is easy to come by; just take an equilateral triangle and draw an altitude to it. You will have two identical 30°-60°-90° triangles. And yes this is one of the special triangles - also used in drafting, and there are rulers in this shape. Where on this picture is the 60° angle? Where's the 30° angle? But what about the height h? Well, that's where we need to dig up the goold ole' Pythagoras. Can't forget him. h2 = 22 − 12 = 3. So taking square roots... h = √3. Can Less Equal More? - Proposal to teach math students fewer concepts in greater depth has divided Md. educators. Maryland currently has between 50 and 60 math objectives for each grade. "The State Department of Education is now meeting with math supervisors in each jurisdiction around the state to get a consensus on whether they should follow the Focal Points." If you remember, Curriculum Focal Points is a fairly new document released by the NCTM. It identifies three most important subject areas or 'focal points' for each grade. No, this is not my giveaway but is happening at HsLaunch.com... they're trying to launch a new homeschooling website with a bang, and have a microscope giveaway going on, till 15th of January. This actually reminds me that I was planning to have a giveaway thingy too, in the near future... Keep tuned. Do you have any expectations for this year? For my websites and books, I am expecting growth. I've put a lot of effort, and still am, in developing the Math Mammoth books. But alongside those, I keep building the sites as well. Yesterday I wrote an article explaining the square root concept for my MamutMatematicas.com site (in Spanish). It took quite some time... I hope it turned out okay. ¿Que es la raíz cuadrada y cómo se la calcula? I've noticed that in Spanish, there is NOT the same wealth of mathematical information as you can find in English. We're just about flooding in English math related websites, I sometimes feel. But not in Spanish ones.